You may have noticed in the past few months that my obsession for Pop! Vinyl has been gradually getting bigger and bigger! So big that I have been searching around the inter-webs for items involving Pops such as giveaways and collection. This is where, though a giveaway, I came across Pop In A Box. Pop In A Box is a monthly subscription where you will be sent 1 Pop! Vinyl every month until you you decide to cancel your subscription. Every month, if you have subscribed, you will have the chance to win extra items in your box such as extra Pops and gadgets. For example: This month (March) you could also win the entire set of X-Men Classic Pops and a Nexus 7! You also get a few bits of candy every month too! Now, onto my Pop! 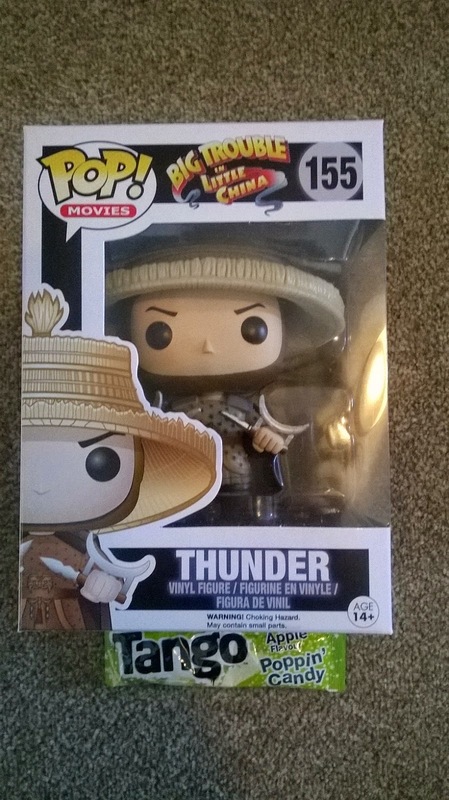 I got Thunder from 'Big Trouble in Little China' who is number 155 in the Movies set. He looks amazing and has quite a fantastic hat too! The Pop! was very well and securely packed and has no scuffs or damages whatsoever. IT is defiantly worth buying these Pops because the more you buy the more you will save! I also got a wee piece of Tango popping candy (which was delicious). To make Pop In The Box even more appealing they give you the opportunity to add what Pop! Vinyl you already have to your collection page so you will never receive any duplicate Pops (Unless you want to that is). But that's not all! There is even a system to down-vote Pops that you don't like so you will never receive something that you don't like. If their super-computers fail to find a Pop that you both want and don't have then you will not receive that monthly Pop and they will also not charge you, how awesome is that?! There is also a shop on the Website where you can buy individual Pops, some of which are exclusive and rare. You can even buy a set of 3 random Pops that have had their boxes damaged for a reduced price of £21 for the set which is perfect if you don't care about the box and just want the out-of-box figure.